This is a zoom lens manufactured by Canon and the model was launched 2003. The lens has a focal length of 17-40 mm. Depending on which camera the lens is used, the experienced and perceived focal length will be different. Please visit the list of compatible cameras below, it will provide the equivalent focal length you get on each camera. A feature worth commenting, which is also related to lens brightness, is that the brightness and maximum aperture-value remains constant regardless of focal length used. This makes it easier for you as a photographer. No matter if you are have the focus ring and focal length at 17 mm or at 40 mm the aperture value can be f/4. If you buy this lens it will come with a lens hood, whose model name is "EW-83E". Text from Canon: "A new and affordable L-series ultra-wide-angle zoom lens that´s ideal for both film and digital SLRs. Superior optics are assured by the use of three Aspherical lens elements, in addition to a Super UD (Ultra-low Dispersion) glass element. Optical coatings are optimized for use with digital cameras. This lens focuses as close as 11 inches (0.28m), and offers both Canon´s full-time manual focus and a powerful ring-type USM for fast and silent AF. It has a constant f/4 maximum aperture, and offers the choice of screw-in 77mm filters or a holder in the rear of the lens for up to three gel filters. Finally, it offers weather-resistant construction similar to other high-end L-series lenses. The EF17-40mm f/4L USM was developed as high-end version of the highly acclaimed EF20-35mm f/3.5-4.5 USM lens released in March 1993. Designed for use by professional and amateur users alike, this lens realizes the outstanding image resolution that distinguishes an L-series lens while retaining high cost performance. Featuring a new optical system design, the new lens delivers an expanded zoom range of 17-40mm, with the wide-angle-end 17mm focal length making it ideally suited to digital photography. 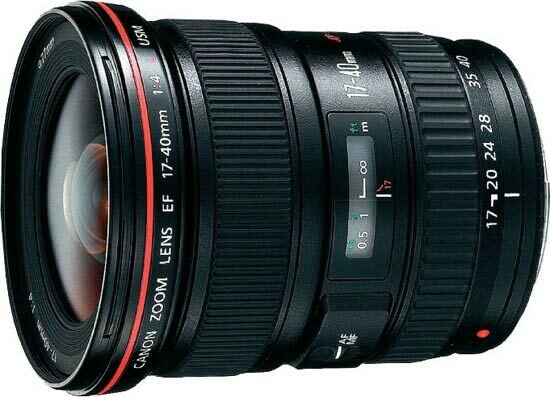 The EF17-40mm f/4L USM utilizes a combination of one high-precision molded glass aspherical lens and two replica aspherical lenses to achieve the extended zoom range, while also correcting for a variety of aberrations that arise during zooming. Moreover, a Super UD (ultra-low dispersion) glass element minimizes the chromatic aberration of magnification that tends to occur with wide-angle lenses, eliminating color bleed along the edges of the subject and realizing high image contrast and resolution. The 17 mm focal length achieved by the EF17-40mm f/4L USM lens also extends wide-angle shooting potential when paired with digital AF SLR cameras, such as the high-end amateur-model EOS 10D , which have smaller imaging areas than 35 mm film. Taking into account the smaller angles of view that result, the new lens realizes a focal range equivalent to 27-64mm in the 35mm format (or 1.6 times) when paired with EOS 10D. Moreover, the power of the focusing lens group has been increased to allow a minimum focusing distance of just 0.28 meters throughout the entire zoom range. The EF17-40mm f/4L USM also features a circular diaphragm for improved background blur, and utilizes only lead-free glass optics in consideration of the environment.The new lens features a hardy water- and dust-resistant construction,ensuring professional users unfailing performance under even the most grueling of conditions."